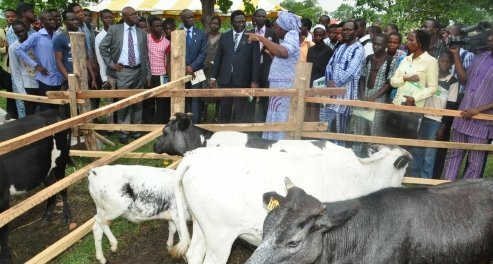 A top official of VEGEFRESH (Holding mic) presenting a Tractor on behalf of her organisation to the representative of the University, the DVC (D), Prof. Felix Salako (Right). The Federal University of Agriculture Abeokuta has entered into partnership with Vegefresh Company Limited to kick-start the production of a complete Nigerian-made Tomato Paste. The Vice Chancellor, Professor Olusola Bandele Oyewole, has described FUNAAB’s partnership with VEGEFRESH as successful and in line with its tripartite mandates of Teaching, Research and Extension. Represented by the Deputy Vice Chancellor (Development), Professor Felix Salako, the Vice-Chancellor stated that FUNAAB was ready to work with farmers and boost agriculture in all ramifications. “We are very glad to have private-public sector relationship; it is something we’ve been doing with our Agricultural Media Resources and Extension Centre (AMREC) and we hope to have a symbiotic relationship that will be of benefit to all of us”, he stated. The Chief Programmes Officer of VEGEFRESH, Dr. Ademola Adeseye Idowu, disclosed that one of the aims of the project was to provide a good platform for research and development, which will in turn help produce high-yielding tomato varieties. Dr. Idowu said members of the Project Team will be granted access to specific research findings and agricultural information that support industrialized production through the establishment of sustainable value-chains in collaboration with universities, national and international research institutes, Central Bank of Nigeria (CBN), Nigerian Export-Import Bank (NEXIM) and the governments of Lagos, Kano, Gombe, Bauchi and Benue States. The IFSERAR Director, who was represented at the occasion by Professor V.I.O. Olowe, disclosed that tomato is an essential commodity to the nation. He added that the University had already adopted 100 acres of land, for the cultivation of various species of tomato. The Ogun State Commissioner for Agriculture, Engr. Ayo Olubori, represented by Mr. Ibikunle Onasanya, commended the initiative, observing that operators of the private sector in most developed countries are the drivers of development, particularly, in the agricultural sector.